Andheri’s favourite and the famous frankie place, Breadkrafts Rolls and Frankies have opened their brand new outlet on Pali Hill and we’re super stoked about it. For those who have been born and brought up in Andheri, specifically Lokhandwala, or those who have lived in this part of the Mumbai suburbs would fondly recall nostalgic memories with Breadkrafts rolls. A humble bakery, more famous for its tummy-filling frankies and rolls with over 100 varieties of frankies, has now opened shop in Pali Hill. 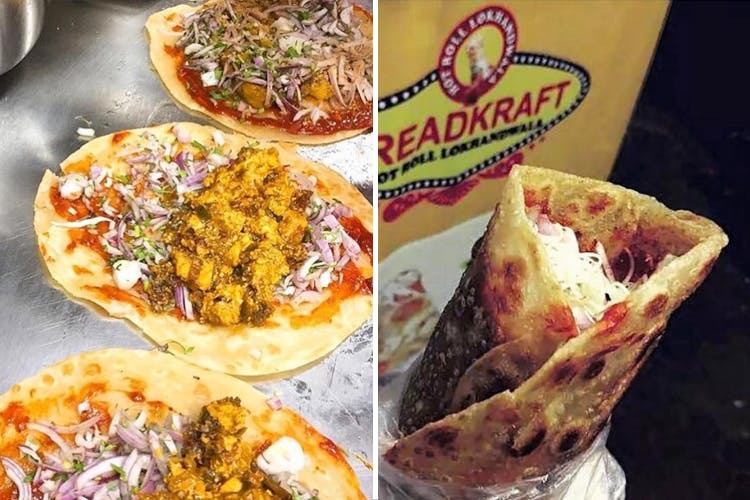 Loved by countless celebrities and layman alike, Breadkrafts has won numerous awards even when the restaurant boom had not hit Mumbai. Why is it so famous, you ask? Well, with prices starting at mere INR 80, Breadkraft frankies are mammoth in size and perfect value for money. One big frankie is more than enough for an individual’s dinner, and he would actually not end up feeling hungry all the way till next morning. Plus, they have unique and fancy flavors such as chicken kadhai, cheese panner mayo, chicken sausages cheese, chicken murg dhaniya cheese mayo, paneer thousand island cheese mayo, chipotle paneer and more. They also have something called the chocolate paneer frankie which you can simply gobble down. Cheap and wholesome, the rolls and frankies at Breadkrafts should not be missed.